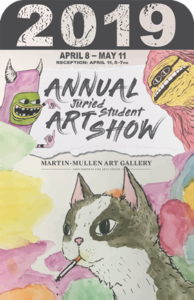 ONEONTA, NY (04/16/2019)– Artwork by Emma Noyes of Poughquag, NY (12570) will be on display in SUNY Oneonta’s Martin-Mullen Art Gallery for the “Annual Student Juried Art Exhibition 2019” in the Fine Arts Center from April 8 to May 11. Noyes’s work includes Modernism Poster (Adobe CC), Bauhaus Poster (Adobe CC) and Book Jackets (Adobe CC) earning a George E. Zimmerman Memorial Award and a Martin-Mullen Creativity Award. Featured artworks were chosen from an open jury process and works entered by the art faculty. 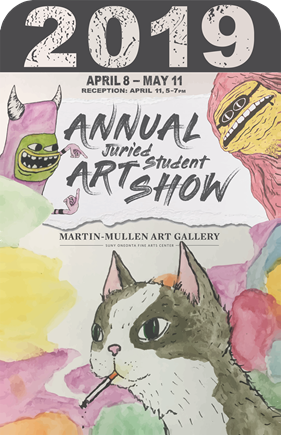 Painting, drawing, sculpture, digital print, digital video, and an assortment of mixed media make up this year’s offerings. All are invited to attend the exhibition. Located in the Leatherstocking Region of New York State, SUNY Oneonta is a mid-size, public, liberal arts and sciences college with a pre-professional focus. The college enrolls approximately 6,000 students in a wide variety of bachelor’s degree programs and a number of graduate certificates and degrees.